Richard Irwin (Belper, United Kingdom) on 18 February 2009 in Cityscape & Urban. The houses are very pretty now , great !! What a pretty place. Nicely captured photo. This serie allow us to visit the place with you and it's a real pleasure - love the colors, like toys ! The colors are just amazing! Beautiful! Beautiful colors. Even in winter -- especially in winter -- this is a nice sight. I'm struck by the surreal cleanliness and evident pride in the town. great colours and light. excellent focus, so clear and crisp. all the houses look crooked, are they on a hill? Very cheerful to see at this time of year! I hope you stayed in one of these and can share some interior shots. @Robert: Thanks Robert. We were only on a day visit, as we always stay in Prague. Les formes et les couleurs sont très belles ! This place is so picturesque! Those colors are just great. How's that hotel? What a beautiful composition! How lucky to have such brightly coloured structures to brighten up the winter days. 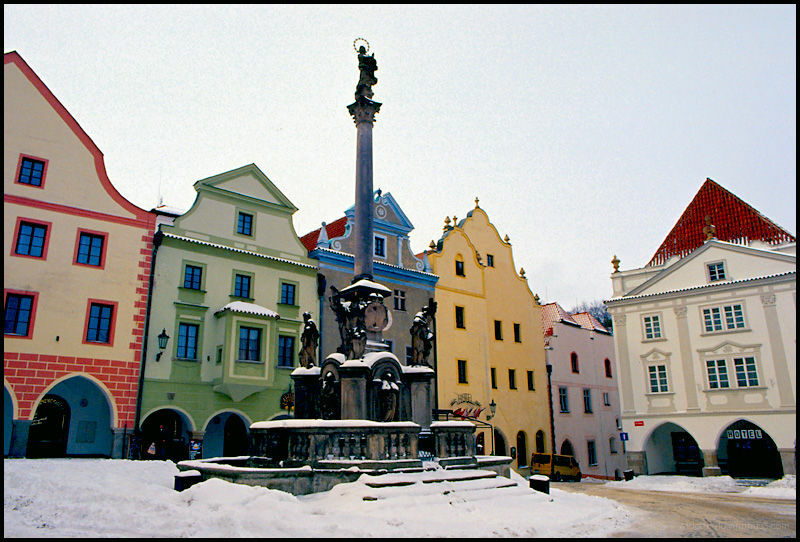 classically European town square - great capture of the style and architecture with the coloured building standing out nicely! Lovely. I've never seen such a colorful city. There's something about those colours that is just so enervating.. Excellent, again, Richard! This is very unusual. What kind of processing was done to this? It has a cartoon quality to it.